Bark of broadleaved trees, fence posts, and sometimes also on rock. Also found in human populated areas. This lichen grows on bark of broadleaved trees and sometimes also on rock. The vegetative body (thallus) is 2″ to 8″ in diameter, leaf-like (foliose), and divided into lobes. It is attached to the substrate (usually bark) at occasional points by tufted or fibrous, anchoring structures (rhizines). The rhizines are black and unbranched. They are dense toward the center, sparse and short toward the margins. The lobes are irregular, rounded, flat, and ⅛″ to 5 ⁄16″ in diameter. The upperside is pale yellowish-green and is not spotted. It is smooth at first, often becoming rough, wrinkled, and folded with age. The underside is black except at the edges, where it is pale brown. It	rarely	produces	spore-producing structures (apothecia). Hammered Shield Lichen (Parmelia sulcata) is gray, never green. The lobes have a network of raised ridges giving at a hammered appearance. Rock Greenshield Lichen (Flavoparmelia baltimorensis) has globe-shaped, pustular outgrowths on the upper surface. It grows only on rocks. 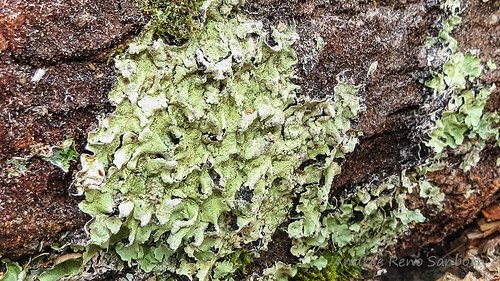 Speckled Greenshield Lichen (Flavoparmelia flavientor) has white pores on the upper surface. Sources: 4, 7, 26, 29. An open, disk-shaped or cup-shaped, reproductive structure, with spore sacs on the upper surface, that produces spores for the fungal partner of a lichen. Os líquenes são organismos muito particulares, que resultam de uma associação simbiótica estável entre um fungo e uma alga, ou uma cianobactéria. Esta associação permite que os líquenes se desenvolvam em habitats onde nenhum dos seus constituintes conseguiria sobreviver sozinho. Lichens are very particular organisms, resulting in a stable symbiotic association between a fungus and an alga or a cyanobacterium. This association allows lichens are developed in habitats where none of his constituents could survive alone.